2 days ago, I had a porcelain veneer placed on one of my upper 2 front teeth because it was chipped. I had bonding on this tooth before, but that fell off. This new dentist said bonding was out of the question because 1/5 of the tooth was chipped, and she recommended a crown. But I told her that I would like to do a veneer as it is less invasive than a crown. Just before the veneer was placed, I had a chance to look at it on my tooth. It looked nice. It was lighter than my other tooth–I picked a few shades whiter anticipating bleaching my teeth afterwards. The shape looked perfect, so I signed the consent. Once it was glued on, I had no chance to view it. The dentist and the assistant told me it looked great. Once in the car, I looked in the mirror, and was in shock. The length of the tooth is a millimeter over to the next tooth and it looks like it is now placed a little forward. It looks like she put too much glue and that overall, the tooth looks protruded. On the back side of the tooth (closer to the tip of the tooth), I can feel a gap between the placed veneer and the back of my original tooth. When I bit in my sandwich I can feel the length difference of my teeth. I called the dentist today and explained the issues. The assistant said the gap in the back of the tooth may be fixed but nothing could be done regarding the length. She even said it’s probably because the tooth moved. I told her I noticed right after the procedure when I got back to my car. I have the feeling that I may need a second opinion. I made an appointment with the dentist, but I’m afraid to go. I don’t know what to do, where to start. Any advice would be much appreciated. Unfortunately, I hear about this type of situation a lot. Most dentists have an engineering mindset, and their appreciation of esthetics in a smile is very rudimentary. This is why they don’t take the time and trouble to learn proper techniques for doing esthetic procedures. Let me tell you how I’m reading this situation. Admittedly, I’m making some assumptions, and I could be way off base as far as this individual dentist is concerned. But this will help you understand how many dentists think and also understand better how to get this done right. First, the dentist says that bonding is out of the question. Why? And why so dogmatic about it? There’s no discussion of the pros and cons, just “out of the question.” It worked before, so it’s clearly not “out of the question.” With 1/5 of the tooth chipped, bonding would have been my first choice for repairing the tooth, and it would be the first choice of many cosmetic dentists. My guess is that she’s not that good at bonding. This is what dentists will do to deflect requests for procedures they don’t feel comfortable with. So she recommends a crown. You perceived this as overkill (I would agree with you), so you asked her to do a porcelain veneer. Based on what happened to you as this procedure was completed, it seems to me that this dentist has limited or no experience with porcelain veneers. But your dentist, thinking that the artistic part is going to be done by the dental lab and not wanting to push you too hard, agrees to do the porcelain veneer, even though she doesn’t feel completely comfortable with that procedure either. So the veneer is done and tried on. You said the shape, length, and thickness were fine when the veneer was tried on. You got a good look at it, which is appropriate. So far, so good. But then when the veneer was bonded on, this is where it gets odd. The instinct of the dentist would be to show you the final product. They had a mirror that they used before, why none now? That was always the last thing we did in my office whenever we did work on the front teeth–hand them a mirror so they can see the final product. Goodness, even my barber does that. But why didn’t your dentist? Because she’s embarrassed at how it turned out. They just told you it looked great. Ooooh, that part really annoys me, that they would try to tell you that. This sounds like a case of getting the veneer positioned wrong when the bonding material was applied, and then when they got done curing it they saw that. This positioning of the restoration is something that is very different between veneers and crowns. It is very easy to seat a crown on a tooth–you just slip it on and it’s very easy to tell when it is fully seated and on correctly. With a veneer, the dentist doesn’t get that same feel for it being seated correctly and it is very easy to get the veneer seated in the wrong position. It also bothers me that when you called with this rather serious issue (your smile has to look at least a little funny with one front tooth longer than the other) that they had the dental assistant answer your questions. And the dental assistant is not right. Of course something can be done if the veneer is too long. If it were otherwise okay, it could be trimmed. In your situation that wouldn’t be good enough–the veneer needs to be re-done. But trimming it would certainly help. And it’s ridiculous to attribute the problem to your tooth moving. 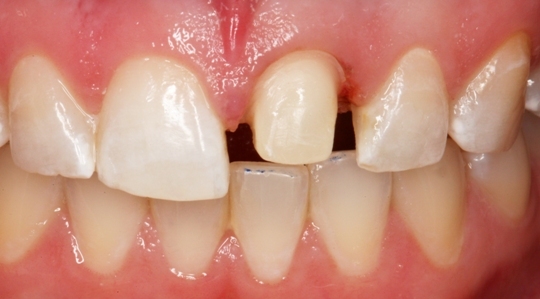 Your tooth isn’t going to move like that regardless of how much time had elapsed since the veneer was bonded. As I said, they probably just got the veneer seated wrong. That’s not a fatal mistake. That actually happened a once to me. The bigger problem to me is their reaction to it. They should have said something to you immediately. The correction, after the veneer is bonded, has to be to completely re-do the veneer. So if this had happened in my office, I would have trimmed and polished the veneer so it looked like the adjacent tooth, I would have told you what happened after showing you the result, and then made an appointment to re-do it. Oh, and another point. If you’re going to bleach, the dentist should have bleached your teeth FIRST, then waited a couple of weeks for the bleached color to stabilize, then done the veneer. Your front teeth need to match exactly, and you can’t bleach teeth to match a certain color. The only way to get the teeth to match is to do the bleaching first. An expert cosmetic dentist would have told you that. So, what to do from here? First you need to get with a genuine cosmetic dentist. Go to our website, put in your city, and see what your options are. We have several near you in northern Virginia. And of course your dentist should refund your money. It seems to me that she is embarrassed about this, and I believe she won’t put up much resistance to your request for a refund. If she does give you any trouble over that, you could file an ethical complaint with the dental society or the dental board. But my guess is that she will want to make this right for you. Be sure you get good documentation about how this looks–have the expert cosmetic dentist take photographs of the front and back of the tooth, because it should be fairly easy to show that the veneer isn’t seated fully. This is a clear error that any dentist should recognize. I had a left central incisor that underwent root canal treatment in 2004. It subsequently turned grey and I underwent internal bleaching last year. The tooth still looks grey under certain lighting conditions and does not match my right central incisor. I am hesitant to get a porcelain veneer or crown as I would like to be as conservative with tooth structure as possible. Also, I am aware of people who have problems with their porcelain veneers/crowns – poor colour matching, cracks, dislodgement, that result in repeated adjustments and more damage to the enamel each time. 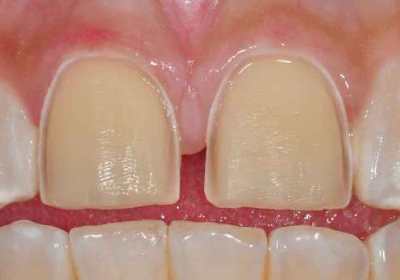 Hence, I am considering composite veneers on either one or both central incisors to match them – if I need to change the composite veneers due to staining 5-7 years later, will I end up grinding off more enamel each time the composite veneer is changed? Is it possible to only drill off part of the old composite and bond a new composite veneer on the old composite itself(i.e. composite-composite bond)? If a composite-composite bond is feasible, then I could replace the veneers as required without harming any more natural tooth structure each time. As composite veneers only last 5-7 years, I am worried that repeated replacements will eventually damage all my remaining enamel if more enamel has to be drilled each time (I am in my late 20s). Please kindly advise if composite veneers would be a feasible long-term solution. I do not mind repeated costs, or having to visit the dentist every few months for touch up. My main concern is being conservative to the enamel, and finding a sustainable solution in the long run. Also, will well-maintained and well done composite veneers look natural and blend well with the rest of my teeth? You’re not going to have to worry about possible damage from having this work re-done repeatedly if you get it done right. But if you don’t have it done right, yes, I have seen a minor correction to make two front teeth match escalate into two full crowns for the front teeth, where each tooth gets whittled down to a stub. The key is going to be getting the right dentist. It is a small minority of dentists who will be able to get your tooth matched. And it is a slightly smaller minority who will do that in an ultra-conservative way, which sounds like what you want. But even if the dentist isn’t ultra-conservative, as long as it is done right you shouldn’t have to worry about repeated assaults on your tooth. So your situation is one slightly discolored front tooth, and you’re apparently happy with the rest of your smile. The way I liked to treat cases like this was with direct dental bonding. I would shave off some of the front surface of the tooth to make room for the bonding material and so that the result would be no thicker than the companion front tooth. And then, with a combination of opaquers, tints, and composites of varying shades and translucencies, I would build up the discolored tooth to match its companion. I preferred using composite to doing a porcelain veneer because I could monkey with the color right there and get a perfect match without trips back and forth to the lab and having to communicate what I was seeing to the lab technician. The same result could be accomplished with a single porcelain veneer. Some dentists will be very aggressive in their tooth preparation for a porcelain veneer and will grind away a lot of the tooth. But most expert cosmetic dentists will be pretty conservative, removing only a fraction of a millimeter of tooth structure. I would think that would meet your requirements of conservatism. And with a porcelain veneer, if the cosmetic dentist has done a lot of these, he or she will want to charge a premium fee, as I did, because there are going to be many trips this veneer will make back and forth to the lab with multiple try-ins to get the color perfect. As far as the lifespan of the work, I will explain why I don’t think that should be a problem. With the bonding, it is the surface that deteriorates after maybe 3-5 years (longer if you use a gentle toothpaste like Supersmile), and the maintenance would simply be re-surfacing the composite. It wouldn’t have to be totally ground off and start over. With the porcelain veneer, if it is done right it could last many years. There isn’t a fixed lifespan there. If you take good care of it so that you don’t get decay on the edges or fracture it, it could possibly last twenty years. It’s not like a tire that wears out, but more like a piece of fine furniture that could fall prey to abuse, but if it is well cared-for could last indefinitely. And then a good cosmetic dentist would have tools to be able to remove the porcelain and bonding composite without significantly affecting the tooth. If you get a dentist who wants to treat both your front teeth so as to guarantee a perfect match, take that as a red flag. The dentist doesn’t have confidence in his or her color skills to be able to match the adjacent tooth. If you do want to share your location, I could help you further by possibly steering you to a cosmetic dentist who would be up to this task. Replacing a single porcelain veneer. Will it match? I have one last question. One of my veneers on the front teeth apparently left some dentin exposed on that tooth. I had a lot of sensitivity but that has improved ( it has been about a month since they were put on). The dentist wants to replace this veneer and fit it properly. However, I am worried that the color won’t match and I don’t want to have to live with one tooth that is different. Also I’m worried about the risks of removing the veneer (possibly breaking the underlying tooth or surrounding veneers. What are your thoughts? I’m considering just living with it the way it is, but if I had more confidence fixing it would be ok, I’d go ahead and have it replaced. I don’t know who your dentist is, but I think I remember your saying that you had one of our recommended cosmetic dentists do this. Anyone we recommend should have no trouble matching your existing porcelain veneers. Excellent cosmetic dental laboratories, which are the ones that excellent cosmetic dentists use, will keep their color formulas for work they create so that they can perfectly match previous work. And damaging the tooth is a non-issue. In fact, you pose more risk to the tooth by leaving this source of irritation than by re-doing the veneer. Exposed dentin has tubules that go straight to the pulp – this is why the tooth is sensitive. And open tubules are a risk for bacteria getting into the pulp. My advice would be to let your dentist do this for you.